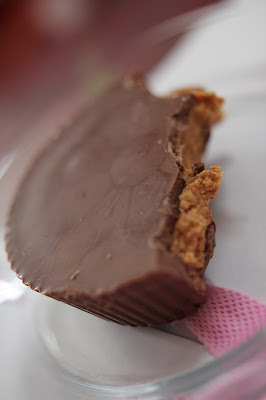 The other day, I was grocery shopping and found the largest peanut butter cup of all time. Since Marc freaking LOVES peanut butter cups, I picked one up for him and wrapped it up with a big shiny bow. Marc almost needed two hands to hold it. I dared him to finish it in one sitting. He smiled. He was off to a pretty good start. Slow and steady. He said the ratio was pretty much like the normal sized cups. A few minutes later, Marc lost. This was what was left after round one. It really doesn't seem like much was eaten, but it felt like he'd been at it forever. Round two was a valiant effort. Round three. Marc was really dedicated to finishing it but just couldn't. A small break later, the peanut butter cup was done-zo. Total eating time: Just under an hour.